A fishy romance? Water the odds. When it comes to Guillermo Del Toro, it's safe to say he works within his own confines. What other filmmaker would be allowed to craft such a stunning love story between a human woman, and an amphibian man that resembles The Creature From The Black Lagoon? Though perhaps a better question is, what director could've delivered a more wonderful final product? In the early 1960s, a mute woman named Elisa (Sally Hawkins) works for a top secret research facility, performing janitorial work alongside her friend, Zelda (Octavia Spencer). One day, they witness the latest experiment to be brought into the facility, an Amphibian man (Doug Jones) captured by Colonel Richard Strickland (Michael Shannon). Strickland's intention is to kill the creature, and utilise the knowledge to aid them in the space race. Unbeknown to them, Elisa forms a bond with the creature, and seeks to find a way to save his life. The early 1960s aesthetic is wonderfully captured, set on the backdrop of the Cold War, which is felt in the witnessed character actions. While Strickland and his General superior wishes to dissect the creature, to aid their efforts in the space race, the Soviet agents wish to be rid of the creature, not for their own gain, but to hinder their adversaries. At the forefront of this story are two wonderful performers, who manage to sell their romance and say a lot in their silent roles. Sally Hawkins does a lot with her performance, wonderfully expressing the loneliness she often feels without saying a word. Her few moments of respite are when she's with the Amphibian man, when these two lonely souls feel a little less alone in the world. The aquatic lead is wonderfully portrayed by long-time Del Toro collaborator, Doug Jones, who conveys so much while only making Amphibian noises, and being hidden underneath phenomenal make-up. The stunning chemistry they share does wonders to sell their unique relationship, helped by the elegant handling of this sweet romance. In a world where the Fifty Shades series takes the world by storm through glamourising abusive and controlling behaviour, this is exactly what's needed. Alongside his recurring theme of humanising those society would consider monsters, a common theme among Del Toro's work is how humanity are the real monsters, and that's true here also. Michael Shannon wonderfully embodies the typical All-American ideal, a square jawed family man, who drives a flash car while serving his country. His portrayal is stunning, providing the necessary menace as the captor and willing torturer of the Amphibian creature. On the flip side is Michael Stuhlbarg, a Soviet spy who inconspicuously works in the research facility, and is amazed by the existence of the creature. As Elisa's friend, Octavia Spencer does wonderfully in the supporting role. A believable friendship is delivered between the two, delivered alongside killer lines that will leave one laughing. Richard Jenkins lends pathos to his portrayal of Giles, Eliza's neighbour, a lonely painter that's closeted, and finds himself ostracised from his employers. The two lend wonderful support to their shared friend, helping her wherever necessary, and helping to strengthen the overall picture. A romance like no other, The Shape of Water expresses so much without saying many words. 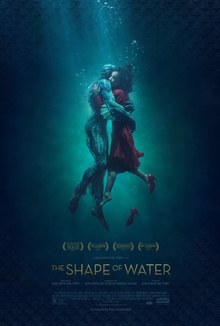 What Guillermo Del Toro has brought to screen is a striking love story that touches one's heart, brought alive through a gorgeous aesthetic, phenomenal prosthetics, and magnificent performances.